Thank you for visiting this website. binz&boris readymade pool is an outcome of 3 years committed R&D. It is inbuilt with Jacuzzi and Swim jet. 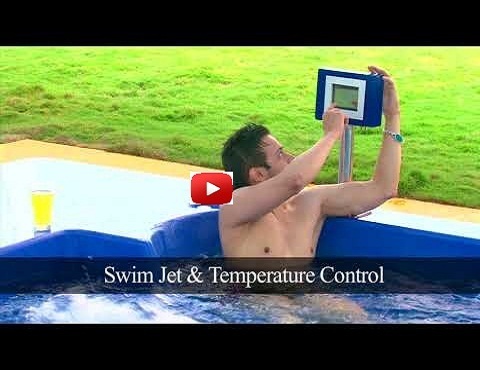 It is a compact pool yet, one can swim unlimitedly or endlessly in its Swim jet feature. 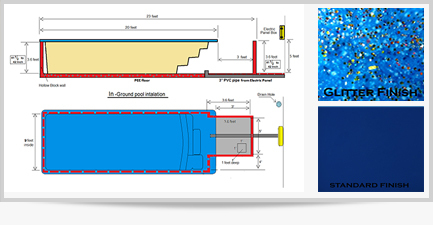 In-Ground ready made pools are suitable to be placed in level to the ground. It can be installed in the Lawn. A pit has to be dug to install the In-Ground pool. We will provide an installation diagram in order to prepare the site. Above-Ground ready made pool gives one a lot of option to install. These ready made swimming pools can be installed in the Terrace, Balcony, Basement, In-house and On the Lawn. 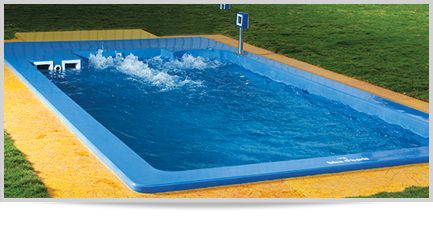 Semi In-ground ready made swimming pools are ideal for installing in the Lawn, Terrace, inside house etc,. It can even be installed with a decking or cladding. 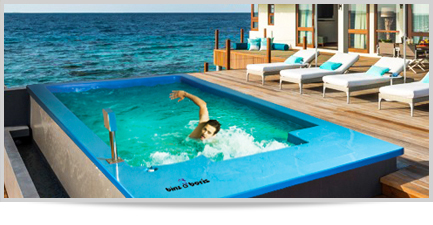 The Binz & Boris readymade swimming pool size is of 20 ft x 9.6 ft x 3.8 ft. It is inbuilt with Jacuzzi & swim-jet. 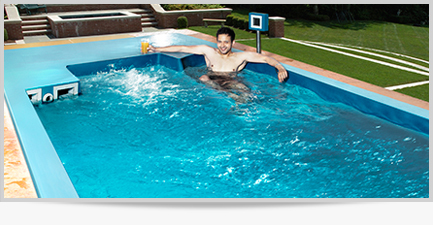 The fibreglass pool is manufactured as a single shell without joints, hence no leakage of water. It has inbuilt steps. 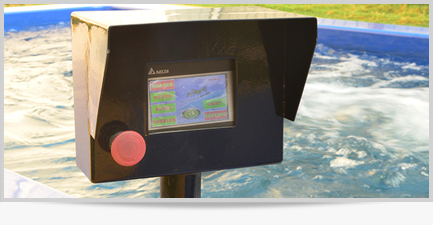 Binz & Boris portable pools does not require a separate pump room, electrical room or filter room as all are inbuilt. It is a self standing structure and can be installed as in-ground or an above ground. 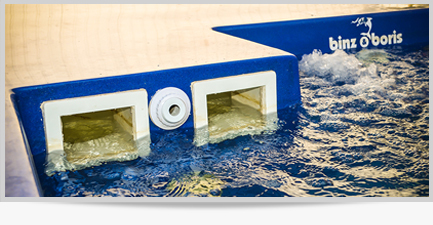 Binz & Boris fiber pools are designed compactly to save precious water and premium space. With its swim-jet feature one can swim unlimited. It is equipped with advanced safety features. It is available in plain and premium glitter shade. In Swimjet one can swim unlimitedly, like swimming in a river against the water current. Binz & Boris is a compact pool, but one can swim in this endlessly. Swimjet will take care of your nostalgia, of swimming in a river or in the canal, which you may have done as a child. The comfort of unlimited swimming amidst your loved ones and in the comfort of your house is un-explainable. The joy and comfort is multiplied when you know that you are swimming in a hygienic and safe water. Binz & Boris fibre glass pool is designed with In-built jacuzzi. It has 7 hydro-massagers and 16 air jets. In this, one can sit and relax while the hydro-massagers will give that pampering massage. 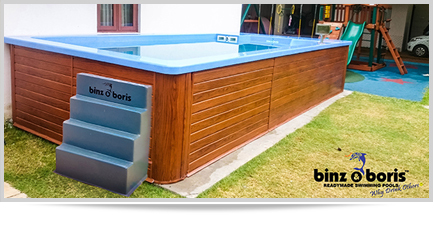 Binz & Boris portable swimming pool is inbuilt with its efficient three stage filtration. It ensures a clear water. The water once filled need not be changed for 1 year. 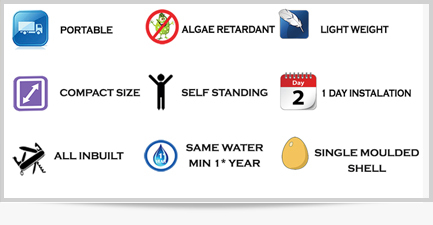 Two Skimmers will take care of the floating debris and the advanced filter will filter even those microbial germs. Binz & Boris ready made pool also has vacum cleaning feature to remove sedimented debris. 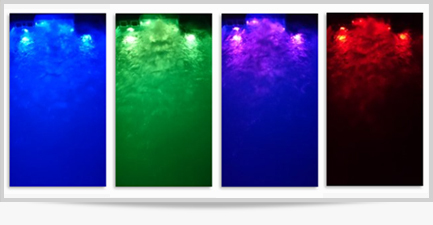 Binz & Boris portable pools has 7 No.s of multi color changing LED lights. Gone are the days of manual switches. Now, it is a trend for touch screens and Binz & Boris FRP Plunge Pool is geared up to give one that touch of luxury at your finger tips. Yes, Binz & Boris is operated through its highly safe password protected touchscreen. You would be able to keep away unauthorized use of the pool with this password protected touch screen. The operating stand also has an emergency switch. Binz & Boris ready made pool is portable. It can be shifted. It can be installed as In-Ground ready made pool or as a Above-Ground ready made swimming pool. Its Single moulded or seamless shell retards the algae formation. It is light in weight, yet strong enough. It is a self standing structure and does not need any supports or pillars. It is compact but gives an endless swim. This compact size makes it easy to maintain and reduces weight and wastage of water, unlike in bigger pools, It does not require a separate pump room, electrical room or a filtration room, every thing is inbuilt. It is factory manufactured and hence quality is ensured. It is resalable and can be installed in a days time. It is also safe to operate. It is equipped with advanced safety features. © 2016 Binz & Boris Readymade Pools All rights reserved.